Not too distant from the collection of smiley, sad, angry, and other round-faced emoticons on your smartphone or IM dashboard is an image of the iconic black-and-white-patched soccer ball. But even if you’re one to use these hackneyed little critters in e-mails and texts, chances are you probably never even realized the soccer ball was there, let alone think to use it. I admit to inserting the ball into text messages a few times in the past weeks as my team, the Albiceleste, kept me on the edge of my seat during the quadrennial FIFA World Cup that ended last month. As it turns out, the real black-and-white soccer ball, with its 32 panels comprising 12 black pentagons and 20 white hexagons stitched together, isn’t as ubiquitous as one might think, at least not in international competition. The German company Adidas, maker of the official ball of Fédération Internationale de Football Association (FIFA) sanctioned tournaments, has designed five different soccer balls for international play—none of them had black pentagons and white hexagons. Remarkably, the traditional soccer ball has not been used in the World Cup since the tournament was played in West Germany in 1974. The search for the optimal soccer ball for use in the highly fêted World Cup has included the Tango, the Azteca, the Questra, and the much maligned Jabulani, which was used four years ago in South Africa. This year, for the World Cup in Brazil, Adidas created Brazuca. Each new ball is engineered with material advances to make the sphere more aerodynamic, more waterproof, and easier to control. If the goal (no pun intended) of ball technology is to make play more competitive, then the Brazuca can lay claim to being a huge success. Pundits (yours truly included) say this year’s World Cup was one of the best in recent history. The Brazuca, along with many other soccer balls, it turns out, is made in Sialkot, a town in the northeast region of Pakistan recognized as the soccer ball capital of the world. Before China got involved a few years ago, seven out of 10 soccer balls in the world were made in Sialkot and factories there produced more than 60 million soccer balls a year. Now it’s down to about 40 million. The Brazuca is produced at an Adidas factory where 40 percent of the workforce is comprised of women—no small feat in Pakistan. The ball has six patches that are glued together, not stitched. This makes these soccer balls, according to Adidas, the most aerodynamic ever made. Testing included smashing it against a wall at 45 mph, dredging it in water to ensure it wouldn’t absorb moisture, and baking it at 130 °F for seven days so that it stood up to the heat of the Amazon, where some of the games were played this year. Wind tunnel tests showed that unlike the Jabulani, which was made in China and tended to change directions in flight when it was kicked, the Brazuca remained stable. 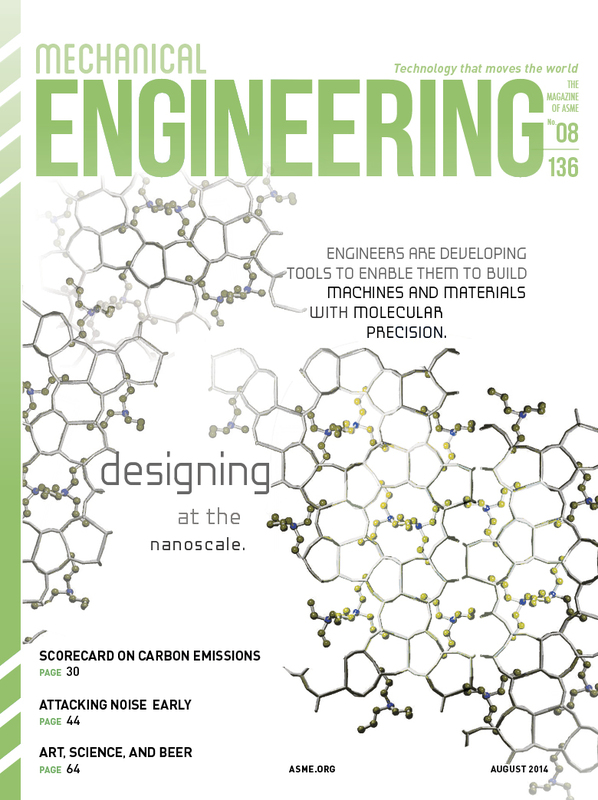 Our cover story this month focuses on advances in material design for different types of applications—nano, meso, micro, and macro scale manufacturing processes. The work is being conducted by the Georgia Institute of Technology’s Multiscale Systems Engineering Research Group. I’m wondering whether the researchers from Georgia Tech will manufacture a high-end soccer ball for those exciting nano foosball games I like to watch.